What are the benefits of using a Personal Trainer? “Beauty does not require sacrifice, its requires regular workouts!“ Julia Nikolajeva, Barcelona Bienestar. What are the benefits of training with personal fitness trainer? There are reasons why people choose to use a personal trainer; the main one is that it’s a faster and a more simple way of improving health and physical condition. Working in and around Barcelona, Barcelona Bienestar offers personal training and other wellness related activities, but today our topic of discussion is pure and simple PT. According to many surveys, the main reason for using a personal trainer is to get professional help to: improve cardiovascular fitness, posture correction, the development of balance and coordination, flexibility, strength, stamina, stability of the joints, muscle strengthening of the spinal column. This list can also include achieving and maintaining optimal body weight, and the reduction of body fat percentage and the growth of muscle mass, forming shape and tone. All of this can be accomplished with the help of a qualified (it is best to always check your trainers qualifications as in some places including here in Barcelona there are many unqualified people claiming offering services) professional who will help you set realistic goals and determine a safe strategy. Along with the training process, your personal trainer will tell you about a correct and healthy diet, because as we know, diet (or better call it meal plan) is one of the fundamental dynamics of successful training process. Proper nutrition is the right step to success! A good trainer will work with your current diet to help set realistic changes. As practice shows, following the plan is the most difficult test for most people. A personal trainer should create conditions and provide their client with the necessary motivation to change their lifestyle with a focus on health and physical activity. If your personal trainer is doing their job properly, they should make frequent measurements of volume and weight, and adjust tracking food and exercise program depending on your goals. An individual approach to each client is the foundation of a personal trainer. This is the fundamental difference between PT and group exercise. The development of this approach is important because we are all different, with different characteristics and limitations in our health. 70% of our clients here in Barcelona who use personal trainers have specific health problems such as arthritis, obesity, osteochondrosis, or problems with the spine of various kinds. A good PT will help you to achieve your goals, taking into account your individual circumstances and condition. Your personal trainer can work in conjunction with a specialist responsible for your physical condition, with a view to developing more effective training programs for you, including solving health problems. The logic is simply: you get maximum results in minimal time, by using a program that is designed just for you. Of course, apart from anything else, the best motivation for most people is to work with a person who takes control and leads them on the path to their goals together. Another great motivating point to create and maintain action without excuses is that it is an obligation to someone who is interested in your results and provides personal attention and support. Varying the workouts is great for the mind and body. At Barcelona Bienestar we use equipment like TRX, weighted vests, balls, bands, jump ropes, and we use use methods such as boxing, HIIT (high intensity interval training) and many functional training exercises. The services of personal coaching are enjoyed by people with many different levels of fitness, condition, age and affluence. The benefits of working with a personal trainer are visible and effective, and they are also now much more affordable so are no longer a luxury item or a closed service only for the rich and famous. You are a modern human with abilities, skills, ambitions and dreams. 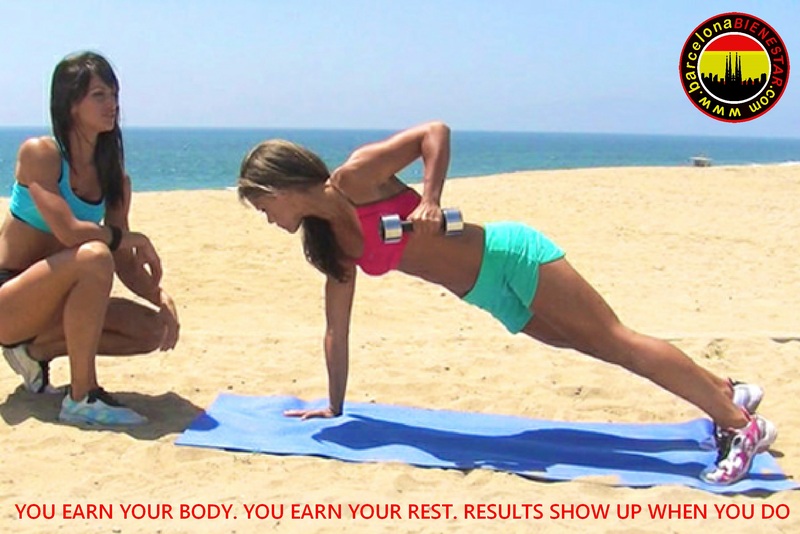 Personal training can help you to unlock you potential. Contact Julia or Chris by clicking on www.barcelonabienestar.com or by calling +34 666925474 and start your journey to health and wellness today! Barcelona Bienestar offer a range of wellness services including personal training, fitness, cardio, Pilates, and massage.